Bourbon and Cake. Or Bourbon Cake. Either Way, Birthday Party time! Waaaay back in 2015, one of the kids gave me a gift certificate to tour the Tuthilltown Distillery in Gardiner, NY, home to Hudson Baby Bourbon and other fine spirits. A tasting tour you say? Why yes, thank you. The day we were scheduled to go was the worst snowstorm ever, the roads were all closed, literally. We cancelled and fast forward to 2017, MY birthday, yay, the whole gang is going now, not only for a tour, but for lunch at the restaurant, Tuthill House at The Mill. Located in Gardiner, NY, the Tuthilltown Gristmill is the oldest continuously operated water powered gristmill in New York State and is listed on the National Register of Historic Places. The original Gristmill structure was constructed in 1788 by 18 year old Selah Tuthill and used an overshot wheel to power the grinding stones. It is one of three mills which have operated on the Shawangunkill over the past 300 years. During the last two centuries, the mill has undergone a series of upgrades and additions. It is located on the old Albany Post Road, which originally served as the main route from New York to the Capitol for 190 years. A classic wooden covered bridge crossed the Shawangunkkill at the Gristmill. Until the railroad was constructed in the 1930s, Tuthilltown was the commercial, cultural and social center of the town now called Gardiner. In the early 1980s, the mill began grinding Kosher matzoh flour which continued until 2003. Though, the Gristmill is no longer grinding flour. The mill has been opened up to visitors, allowing everyone a first hand look at this unique building. Throughout the facility are still the functional pieces of mill equipment, shafts, hoppers, grain elevators, hullers, blowers and the original stone grinding wheels. The mill continues in “working” condition. Usually near impossible to gather everyone for one day and time, when this destination was listed as option one, the texts flew in quickly, Yes, can go. No surprise there. We’ll do a Sunday Brunch first, then tour the distillery, figuring if we tour first, we might not get to brunch! Looking forward to the day, a full year away from turning 70. Speaking of which, we are already planning a huge 2018. My mom will be 100. I’ll be 70. My sister and her husband will be married 50 years. Gladly taking suggestions on how to put all that merriment in one getaway package. Incredibly windy and cold day. Cooking up a storm for Dawg and making some kale soup for myself. The best thing about the Dawg stew is that if I get hungry after eating kale soup, I can dip the fork into Dawg’s beef stew! Happy Hump Day. Are we taking bets on if the Trump Healthcare Plan passes or gets called in today for rewriting? Per CosHarbour’s request, this photo from SoundBeacher from Butternut. Niiiiice. Tonight our club is having a special “bourbon/scotch” dinner. We are more wine-o’s 🍷 So, were not going, but it’s been a bit of a thing here this year. Someone arranged to have a house branded scotch from Kentucky under the clubs name, and one of the lounges offers various smoked scotch drinks, which my hipusband loved. They basically pour your choice of scotch (Europeans call it whiskey) into a snifter, add various types of smoke (maple, apple, etc) to the snifter and let you look at it for a few minutes, swirling it around. It had a great effect and was fun to try. I keep buying artisanal rums, but they just sit there, undrunk. How about a family cruise for the 2018 bonanza? Everyone gets their own space and room, lots of activities for every age group. That’s under consideration. The hard part is at 100, while my mom is perfectly able bodied, the hallways are incredibly long on a ship. Might be too much for her. We’re also thinking of renting a house somewhere. Lots to consider. Lots of ages. Lots of opinions. Boy that sounds fun. Do you all go by Uber, or is there a designated driver among you? Will you buy a lots of bottles to give as gifts? 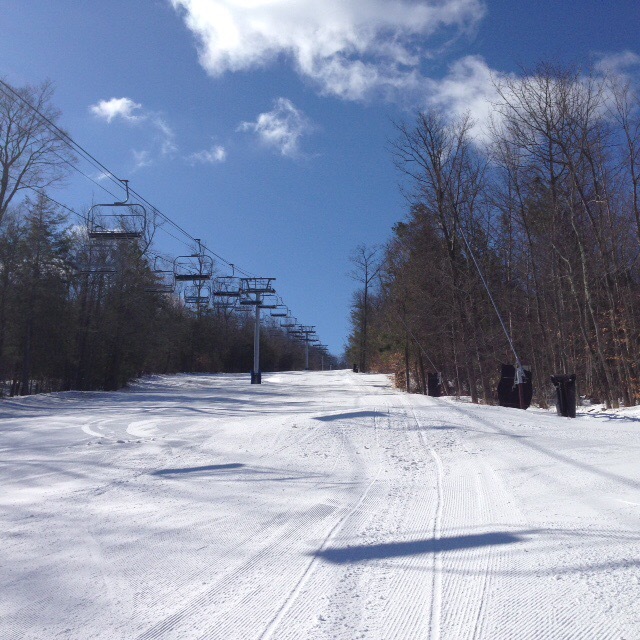 We went skiing today up at Butternut. Temps in the 20’s and dropping, wind 23 mph with a feel like temp of 6 degrees. Much colder than when we were out in Park City, Utah, last week! There it was Spring skiing. Nah, no one is really going to drink. It’s a tasting tour, at most we get a sip and I’ll not have a drink with brunch. Nor will Mr. EOS. We’ll be the drivers. You were brave to ski Butternut yesterday. The wind and cold were not for the faint of heart. Your face must have wind burn. Park City is one of the finest ski resorts around. It tends to get solid skiers and not the Aspen fluff crowd. Plus it’s just so beautiful! Lucky you to get out west. SB: if you would be so kind, please post a few Berkshire shots. Great Barrington be damned! Breckenridge was beautiful but the skiing so-so last week. United got us out of LGA right on time last Wednesday after the storm. Was in the 50s with afternoon mush every day. Seemed like the entire state of Texas was there (apparently it was Texas school break week) from the number of Aggie sweatshirts we saw. This is too funny. The grandson of my Iowa family, a student at University of Iowa, was at Breck for the week with a bunch of his classmates. Was the place to be. Back in my Colorado “college” days, Breck was the only place we could afford to ski. I loved it then but haven’t skied there in eons. Mush is better than northeast corn. Did you see the moose? A video went viral of a moose running down a slope at Breckenridge. Was very funny. Glad you got out of dodge. Thanks for the update.